Atlantic Research Corporation's (ARC) LEROS 1C Liquid Apogee Engine has successfully performed orbit-raising maneuvers for two A2100 satellites built by Lockheed Martin Space Systems Company, Sunnyvale Operations. 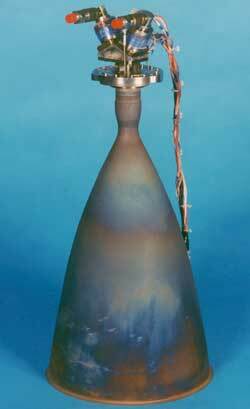 The LEROS 1C engine uses a conventional columbium chamber with hydrazine and nitrogen tetraoxide as propellants. It delivers a specific impulse in excess of 325 seconds, which is up to 10 seconds higher than other engines of its class. This increased performance offers significant advantages, including increased payload capability, longer on-station life, and reduced launch costs. The LEROS 1C was developed and manufactured by ARC UK Ltd. located in Westcott, England. The LEROS 1C is the third generation in the successful LEROS 1 engine series, of which over 45 engines have been flown on various communications satellites and interplanetary missions. ARC UK Ltd. is currently developing the LEROS 1D apogee engine, designed to deliver specific impulse in excess of 330 seconds. Development is also proceeding on an advanced 5-lbf attitude control thruster, the LEROS 20Ha, which will use the same propellants as the LEROS 1C and 1D apogee engines. Both programs are co-funded by the European Space Agency and are part of ARC's continuing commitment to provide advanced engines to the space industry. ARC, a unit of Sequa Corporation, is a leading developer and producer of solid propellant rocket motors, gas generators, advanced composite materials and liquid propulsion systems, including the liquid propellant rocket motor line acquired from Royal Ordnance in late 1998. ARC also produces automotive air bag inflators and supplies energetic components for the inflators from its high capacity propulsion plant in Camden, AR. Sequa Corporation is a diversified industrial company whose other principal interests include the manufacture and repair of jet engine components, the coating of coiled steel and aluminum, and the production of specialty chemicals, can machinery, auxiliary press equipment, and automotive cigarette lighters and power outlets, and men's formalwear.